“Neither federal nor state government acts compatibly with equal protection when a law or official policy denies to women, simply because they are women, full citizenship stature – equal opportunity to aspire, achieve, participate in and contribute to society based on their individual talents and capacities.” -Justice Ginsburg, United States v. Virginia. Justice Ruth Bader Ginsburg’s birthday was this past Sunday, March 15th. She was born in Brooklyn in 1933. She graduated first in her class at Cornell in 1954, and shortly after having her first child, she enrolled in Harvard Law School. She was one of only eight women in a class of 500, and she became the first female member of the Harvard Law Review. She later transferred to Columbia, where she again graduated first in her class in 1959. Justice Ginsburg taught at Rutgers University Law School from 1963-1972 and at Columbia from 1972-1980, where she became the school’s first female, tenured professor. She also served as director of the Women’s Rights Project of the ACLU, arguing six cases on gender equality before the U.S. Supreme Court. Justice Ginsburg was appointed to the U.S. Court of Appeals for the District of Columbia in 1980, and to the U.S. Supreme Court in 1993. In 1999, she won the American Bar Association’s Thurgood Marshall Award for her contributions to gender equality and civil rights. Among her most famous opinions are the majority in United States v. Virginia, which held that Virginia acted unconstitutionally in refusing to admit women to the Virginia Military Institute (VMI); M.L.B. V. S.L.J., holding that a state may not deny a parent, because of her poverty, appellate review of the sufficiency of the evidence of a parental termination decree; Ring v. Arizona, holding that the Sixth Amendment prohibits a sentencing judge, without a jury, to find an aggravating circumstance necessary for imposition of the death penalty. She authored notable dissents in cases involving affirmative action, racial gerrymandering, and in Bush v. Gore, which effectively decided the presidential race between Al Gore and George W. Bush. Justice Ginsburg was never much for cooking. Her husband, Martin, an avid amateur chef, said of their relationship’s success, “My wife doesn’t give me any advice about cooking and I don’t give her any advice about the law.” They were married for 56 years until his death in 2010. 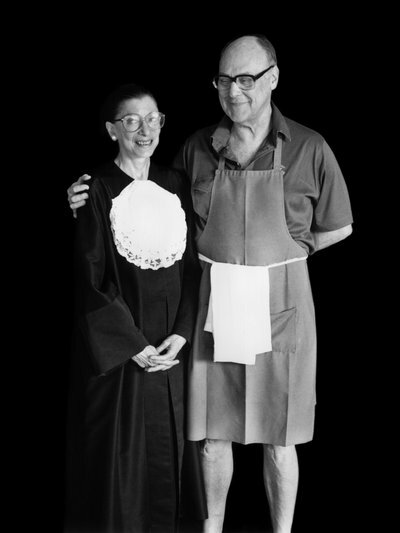 Shortly after he died, the spouses of the Court justices compiled his recipes into a cookbook, Chef Supreme: Martin Ginsburg. Among the recipes Justice and Marty Ginsburg dined on is a delicious salmon with a grapefruit and coriander sauce.